Colin Gunton is regarded by many as one of the most important English theologians of the twentieth century. A prolific writer and creative thinker, Gunton taught at King's College, London, for over thirty years, until his untimely death in 2003. In this first single-authored introduction to Gunton's theology, Uche Anizor traces the key theological themes, major contributions, and criticisms of his work. Each chapter provides a synthesis and overview of Gunton's thought on a particular doctrine or set of doctrines, calling attention to the particular Trinitarian shape of his theology. In Trinity and Humanity, Anizor provides a handy entree into the corpus of the man. 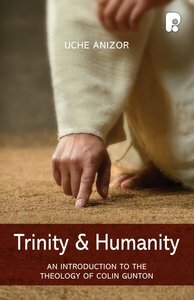 About "Trinity & Humanity: An Introduction to the Theology of Colin Gunton"
Uche Anizor (PhD, Wheaton College) is associate professor of biblical and theological studies at Talbot School of Theology at Biola University. He is the author of Kings and Priests: Scripture's Theological Account of Its Readers and a contributor for Aspects of Reforming: Theology and Practice in Sixteenth Century Europe. Uche is a member of the Evangelical Theological Society and the Karl Barth Society of North America, and his interests include theological method, the theological interpretation of Scripture and the theology of Colin Gunton. He and his wife Melissa live in La Mirada, California.